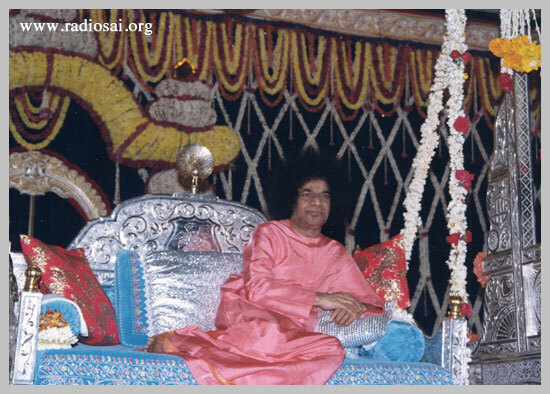 Radio Sai (RS): After 12 years of learning and evolving and taking baby steps to understand yourself and Baba, building this relationship… suddenly, you were catapulted into limelight. 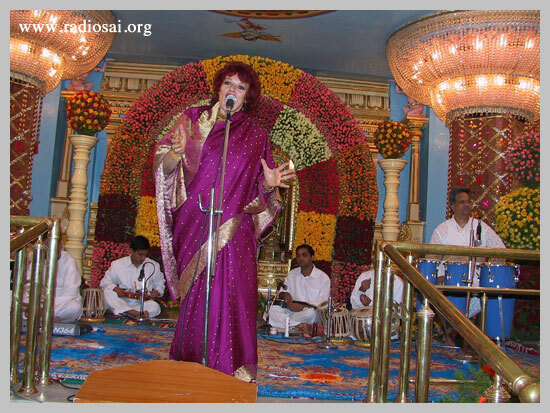 You got to perform at the 70th birthday in the Divine Presence. From this anonymity to the celebrity status, how did this change occur? And so, I had to produce (from its hiding place) this hot and sweaty thing and hand it to Him and He took it into the mandir. He’d finally accepted this little offering. So, I did go ahead and press the first CD, which I made three under the name of ‘Third Man’. I didn’t want to confuse the blues fans who might have mistaken it to be a new blues CD from Dana Gillespie and put it on, “Oh! What’s this?” So, I had to change my name. Then, of course, they started releasing it here with a sticker saying “Featuring Dana Gillespie”. Now I don’t bother with ‘Third Man’. So, I had to search around for musicians that could actually help me out because half of my band said, “We’re not going to go to a place where you can’t eat meat, smoke a cigarette, or have a drink.” That was quite difficult. But, I managed to get an odd assortment of guys together and that was my first experience. And it was an amazing one, because when we arrived there was somebody meeting me at the airport with the sign 'Artists'. The crowds parted. We were looked after. Everywhere I went, I was being fed, couldn’t believe my luck. 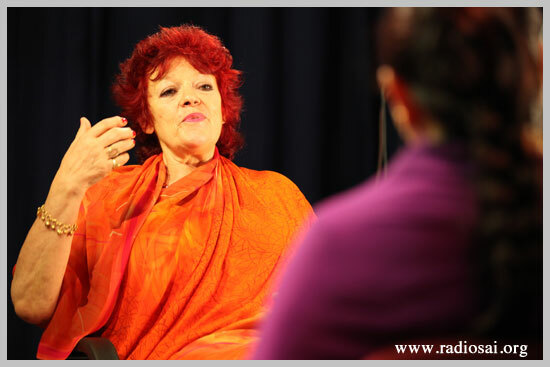 RS: You’d had a huge changeover in your life in Puttaparthi now! DG: Yes, but it wasn’t always a bed of roses. I learnt some interesting things. I got a terrible flu-like thing two days before. I had no voice at all on the day of the concert. I couldn’t see my band, since they were in the men's section, I couldn’t tell them and I didn’t want to worry them because they had no idea what they were doing. They knew they were coming for some sort of weird Indian experience but this was beyond their realms of imagination. And also, you know, everything was chaotic. And I learned a very good lesson. The performance which was about to go on before me, was axed at the very last second. So, all these little children with mascara trailing down their faces were really unhappy. Anyway, I said to Swami (I’d learned to talk inside by this time) and He was sitting in the Shanti Vedika: “Listen, I’ve got no voice. You’ve got me all this way. You’ve got to help me. If you’re going to help me, would you please look at me now?” And He turns His head and looks at me. So then, two minutes later, somebody came up to me and said, “I think you should have these five cloves.” And then somebody else came up to me and said, “Here’s some vibhuti for you”. And I must say when I stepped out on stage to sing, I probably had about 60 percent of voice but that’s enough for blues. I had no idea what I was doing. Everyone had said, “Don’t worry. The day after the concert, all the artists get an interview”, which, of course, when you don’t know anything, that seems to be your goal — “I must get an interview.” It took a while to realize that the inner view was the better way to be. So, the next day, we’re all lined up — the women, the artists, the men. Swami comes out and He picks every single person except me. I’m the only one that sat on my own for once in full view of everyone, wanting to die. RS: That must’ve been so hard! DG: Well, it was. Even as I tell you this now, I can almost taste the blood in my mouth where I chewed my gums so as not to cry, because I basically just wanted to howl and fall to pieces but I was in full view and I’m British. So, you have to have the stiff upper lip. So, I chewed my gums and I had to hold my head up high and walk out of that place knowing that I was the only one who’d been rejected. Awful! Awful feeling! DG: Well, I thought everyone hated me anyway for singing blues. Don’t forget that at the moment that He’s swinging on the jhoola, there’s blues going on. And I know 99.9 percent of the Indians are expecting marvelous holy music with sitar or something. So, I thought they’re going to hate me. And in fact, a day or two later, a German woman said to me (didn’t know it was me), “Ah! That dreadful Western music when He’s on the jhoola!” And I said “Well, actually, it was me!” And she went the color of a tomato but I understand people’s reaction. They’d never heard blues because most people don’t know how spiritual blues actually is and it is a thing that is very heartfelt. So, He didn’t tell me, but I felt… yes, the nice thing is He answered a prayer. And this is the other thing. If you do pray to Him, He does answer your prayers. And we forget this. And five years later, He’s on the jhoola. RS: And you’re singing to Him! DG: Yes, although I was probably still hated by 99.9 percent of the audience. But, they’ve slowly kind of got used to me. I mean, I’ve performed in the Poornachandra Hall with backing tracks. That’s also rather an unusual thing. I’ve never seen anyone with backing tracks. RS: But if I may backtrack, how did you make sense of that moment where Swami didn’t pick you as an artist? How did you convince and console yourself and come back? I’m sure you felt terribly rejected and sad at that moment. DG: I felt small, lonely, and unloved. It’s quite difficult for me to feel small. But, I certainly felt it then, went home to my room and howled into my pillow. But then, I remembered about this prayer (to sing when He was on the swing). So, I knew that He’d answered it. But of course, I was still yearning to have an interview… but I went home and it was still a great experience. I came back a few months later and He did actually give me an interview. He didn’t say very much to me, but I think He just knew I was yearning to see what the inside of the room was like, anything, I didn’t know what I wanted. RS: So, you’ve flown to countries people haven’t heard of? DG: Well, have you heard of Dagestan?… though it’s not technically a country. It’s a part of Russia. But it’s on the Caspian Sea, next to Azerbaijan. Also, Uzbekistan, Kazakhstan, Kyrgyzstan, Siberia, Lithuania, Latvia, Estonia, Romania, Hungary, Poland, as well as the well known destinations like Australia and America. But, I love these countries that are Muslim. They’re Russian-speaking, but the Muslim countries I adore. And Swami once said to me… He was talking to somebody else. He suddenly looked to me and said, “The Sufis are very good.” And then He carried on talking. And this got me thinking because I’ve always liked the aspect of Sufi thought. You know, it’s not a religion. It’s not organized. Its religion is the religion of love. And there’s no intermediary like a priest. You need somebody to speak to God? No way, it's ridiculous! Let me go direct to the big boss, which of course as we know is inside. And the Sufis function like that. And I was quite cheered that He should say this and I’ve had quite a few interviews when I was surrounded by Iranian Muslims when I’ve been in there, which were quite rare in the old days. There were not so many of them. I’m happy to see there are a lot more now. So, I have a feeling that’s why He’s always made sure that I’ve enjoyed these bhajans like ‘Allah ho Akbar’ and ‘Salam alaikum’. It’s a very old bhajan over 50 years old. DG: They adore it, they absolutely adore it. I think they’re quite happy that anyone is mad enough to go to these places. I mean, because some of them are villages in the middle of nowhere. I’ve slept practically on floors and it’s not just me alone. It’s with the heads of Zone 8. DG: Yeah. And one of them is a Dane - Steve Picolo. And one of them is Valerie, the Russian. I’m not sort of thrust into the world on my own. I’ve got a little bit of a team around me. And they react amazingly. And because I’m not shy or timid or nervous in front of a camera or a microphone, because it’s what I’ve been doing, for me, it’s like breathing, I make people feel at ease when I talk to them or sing to them. And I think people can react to this. 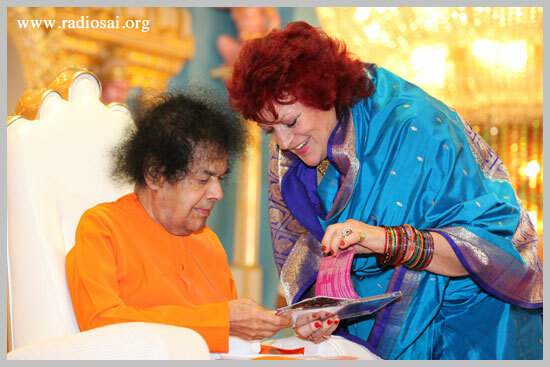 Even when I sing in front of Swami, I talk how I’m talking to you now because that is communication and it’s from the heart. So, they react to this and I have a chance later on stage, I tell them the words of the songs that I’m singing. So if it’s a bhajan, obviously, they usually know them better than I do. 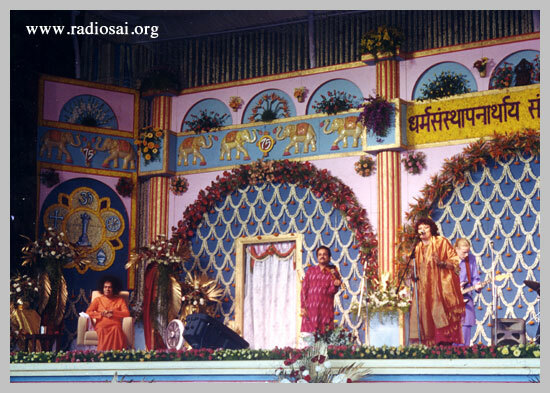 DG: All these years of Godlessness… now they are flourishing, blooming like flowers and absolutely ready to imbibe it. And the amazing seva that they do to homeless people, to animals... Swami has said the Russian-speaking people have an amazing heart and it is very similar to Indian hearts. And they react amazingly. So, of course, from the moment I start off with ‘Allah ho Akbar’, they’re beaming away and little old Muslim men with orange beards and a stick and a hat popping up and down, which is unheard of. And sometimes, they get up and dance to the bhajans which of course I’m quite pleased about. I always say this. It used to make me miserable, but the first bhajans I ever learned of these Bhajanavali cassettes, came with one bhajan book - it had a list of rules at the beginning saying ‘Things to do and not to do’ when you’re singing bhajans. And one of them is that you must sit rock-still. This used to bother me as once the music’s going, I can’t sit still. And Swami once said, “Yeah, Dana, she dances like this.” And He did me better than I do me. What a sense of humor He has! So, He knows I’m not going to sit still and I know probably it (my swaying to the beat) wasn’t very popular in the beginning. And not only was He not furious, at the back of the Poornachandra, some people, were up and were dancing in the Poornachandra Hall. I thought that was pretty amazing. So now, in the Russian-speaking countries, I tell them this story that people have danced to bhajans and they all go “Yes!” and they’re all up and dancing. So, I do it usually as the last number and they’re all going “Prasanna Ho!” and they’re all raving around like this because music has to be joyous and it has to uplift the soul. RS: And it’s a celebration of divinity! DG: Well, I do two different types of concerts. 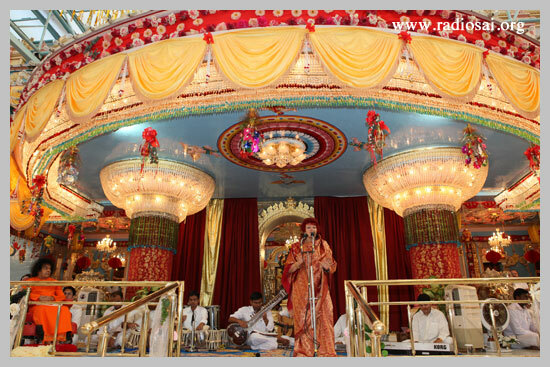 I will do concerts or talks at Sai centers. So, I don’t have to introduce Him. He’s already known. But somewhere like Uzbekistan and Tashkent, it’s not technically allowed. And Singapore too, you can do an insider’s concert; so, that’s no problem; don’t mention Him. So I just mention His message of love and for me the message is more important. He Himself keeps saying that. So, it’s very easy for me to talk about His message to these people. DG: Sometimes they have. One example was in Samarkand, we’d gone there with a team of people. He produces a picture himself from his pocket. He’s got Sai Baba key ring, and he said, “But He’s been here”. And the Sufi gentleman brings us into his kind of prayer room, if you could call it, and there’s a big picture of Shirdi Sai Baba and Sathya Sai Baba on the wall, which for a Muslim, who won’t have a form, is a pretty big deal. DG: Yeah, physically, yes, he’s seen Him. DG: These things are inexplicable for me. But they’re as inexplicable as… the vibhuti pouring off pictures in various parts of the world or the amrit dropping off things. I know these things aren’t in the big picture that important. But if you are living in a village somewhere in the middle of nowhere and suddenly, I’ve seen this in a man in Dagestan, Vibhuti appears on His photograph. I mean, the joy that it gives is incredible, this omniscience thing is incredible and I actually am more moved by devotees who have never seen Swami in the flesh than those that come here and see Him. And those that see Him in the flesh can easily be misled and think that He is this in the flesh. It’s a very easy mistake to fall into, you know, everyone’s wanting to get up the front because they think “Is He going to see me, look at me?” It’s so easy to fall into that trap. But over there, they don’t have this possibility. So, they’re seeing with inner vision. In July this year (2010), I was in Russia, with Valerie in St. Petersburg and they’re doing seva; they’re doing up the houses of little old ladies who are of 80. One had only one leg. They’ve got no windows, they’re broken, holes in the ground or the floor, who’s going to cut their wood at winter time? And it’ll be -30 degrees at winter time. These people, their selfless service is amazing, they were giving out food packets. I’m humbled to the size of an atom when I see what these Russians do and I’m so grateful that I’ve been given the chance to do this and to bring some joy. And so, I was giving a concert wherever I go. And I never have enough CDs, I can’t physically carry enough, you know. RS: There’s such a demand. DG: No, no, because I think for bhajans, it’s Swami’s music. It should be global. I long for somebody to come into my life and go, “Let me handle your whole stock of CDs and I’ll do a catalog” because I’m not a businesswoman. I’m a musician and I can’t find anyone that knows how to do it or has had enough oomph to come to me and say, “I can do it.” But, one day, He’ll send the right person. I can carry in my bag maybe a 100 pieces and then you’ve got over the limit of your luggage. I must carry the right clothes for looking presentable, because one is actually representing the Lord and bringing good news. 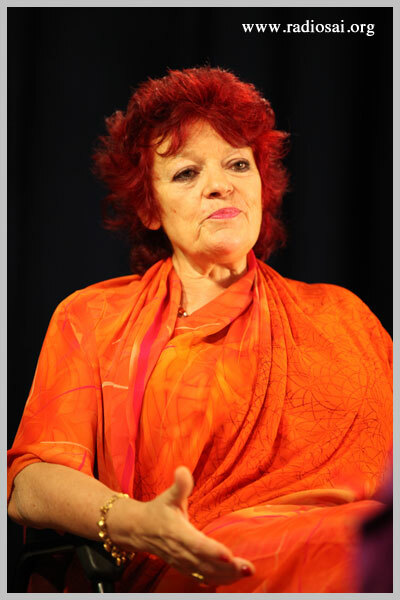 RS: Swami seems to have put you in this role where you’re going to these Muslim countries in the former republics of the USSR because you have a very strong Sufi connection from a long time ago. Even your book ‘Mirrors of Love’ has beautiful sayings from various faiths which actually resonates what Swami says. And a lot of the content is Sufi. Where did that connection start? RS: But Dana you’re a Church-of-England girl. DG: I was born but I always felt uncomfortable with that. I actually never… really like the sign of the cross, because for me, it represents pain and suffering. Every English church has Jesus, with blood dripping off Him, looking agonized. And over here, everything is joyous and lovely. And as a child, I used to really be unhappy being told by the priest, “Only through Jesus you’re going to find salvation. The rest of you are going to hell and damnation.” This as a child I could not accept. And so, after I was confirmed, which, I must tell you, I only did because my mother paid me 30 pounds to go through this ritual. And I did it for the money because I could have some more drum lessons. I’m being honest with you now over this. DG: I think so. I probably lived in a desert. I can’t even eat a date now without feeling a bit nauseous. I probably lived on dates. And I’ve got this passion for camels.